It's been almost 51 years since the assassination of Martin Luther King Jr., the African American preacher who led a civil rights movement that changed the nation and reverberated around the world. FILE - Martin Luther King Jr. and other civil rights marchers cross the Edmund Pettus Bridge in Selma, Ala., March 21, 1965. 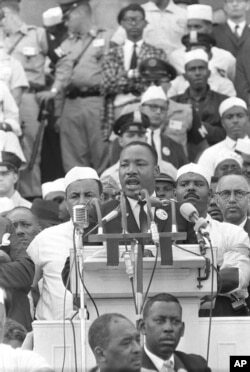 FILE - Martin Luther King Jr., head of the Southern Christian Leadership Conference, addresses marchers during his "I Have a Dream" speech at the Lincoln Memorial in Washington, Aug. 28, 1963.